Today, after many years of searching, I finally learned the origin of my Wallace family prior to Canada: Parish of Feakle, County Clare, Ireland. I also personally inherited the Wallace "family blanket," which used to be in the possession of Wallace's sister, my great-grandaunt, Marlene. It's a Scottish blanket made of wool, decorated in the Wallace clan's colors (they were Scotch-Irish). On top of all this, I'm working on a novel right now, inspired by a true story - that of Wallace Kanalley's parents, Jim Kanalley & Mary Wallace. More to come later on that. in Canada, whose father Daniel was born in Ireland. Wallace also came to Canada, dying in the 1850s. So learning of the Wallace's origin is really exciting. How did I make this discovery? I've been going through the early Cobourg, Ontario, Roman Catholic church records (digitized here), literally page-by-page for clues on the Wallace family. I found this burial record today listed under Nov. 26, 1857: John Wallace interred, from the Parish of Feakle, County Clare, age 78 years. It was what I needed after finding just days earlier this burial record under July 16, 1854: Catherine Wallace, wife of John Wallace, age 72 years. They were who I was looking for after finding the death certificate of Martin Wallace years ago (he was my 4th great-grandpa Daniel Wallace's brother). It lists the parents as John Wallace and Catherine Cain. So I knew their names were John and Catherine. I did NOT know if they made the trip to Cobourg with their kids (and 1851 census for Cobourg was destroyed in a fire), but I assumed so since there was at least Daniel, Martin and their sisters Catherine and Mary who made the voyage in the early 1840s. 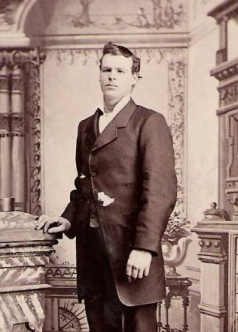 of my ancestor Andrew Martin Wallace. Now I know for sure they did. Further research of the Cobourg records shows Wallaces witnessing "Kane" and "Keane" births, marriages, etc., so I am confident Catherine's maiden name was actually KEANE as it is spelled in Ireland. Solidifying the connection, I found a John Wallace in the 1827 Tithe Applotment Books in County Clare listed in Parish of Feakle here. He's the only Wallace in the parish, but there are several Keane's. Conveniently, Feakle parish in Co. Clare is located between Co. Galway and Co. Limerick, both counties I will be visiting when I go to Ireland this fall. I can surely drive through it. Prior to this discovery, I didn't even know what part of Ireland the Wallace's were from - not a clue! Not only did this give a county but a parish. And the Tithe Books list a townland for John Wallace too, within Parish Feakle: Kilanena. There's also an Edward Keane and William Keane in the same townland. It's worth noting that since Wallace is such an uncommon name in Co. Clare, it's reasonable to assume John Wallace came to Co. Clare from elsewhere. And since I know the family was Scotch-Irish in origin, he surely had roots in Northern Ireland, where the Wallace name is prevalent, and further back in Scotland. Related: I just went to Cobourg, Ontario, where John Wallace and Catherine Keane died in the 1850s, last weekend. It was my first stay there. Photos here and here. This morning, Mitt Romney announced Rep. Paul Ryan (R-Wisconsin) as his running mate for the 2012 U.S. Presidential election. As I did four years ago when Joe Biden and Sarah Palin were announced as VP nominees, I immediately began looking through Paul Ryan's family history to see if I might find any interesting links to my own family. He is Irish and German, as am I, and I have plenty of cousins in the Midwest, so I was very excited to commence this search when I learned he was the nominee. If Ryan and I are blood related, I determined it's most likely through his mother's side. His mom's maiden name is Hutter, and her ancestors are from Bavaria, Germany, where I have plenty of roots. Sure enough, I'm a descendant of a Bavarian-born woman named Cecelia HÜTHER (same family, more German spelling) - in fact, so is Nicolas Cage - she and her husband Heinrich Ludwig Vogelgesang are our most recent common ancestors. BUT, I found a REALLY interesting connection nonetheless. 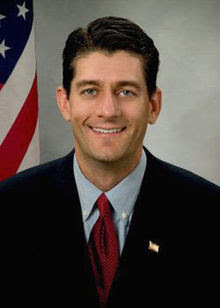 Paul Ryan was born and raised (and still lives in) Janesville, Rock County, Wisconsin. Many of his Irish roots are in Rock County. Would you believe I have an Ireland-born ancestor myself who once lived in Rock County, Wisconsin? My 5th great-grandfather Michael Tracy can be found in Rock County, Wisconsin in 1860 per the U.S. Census. 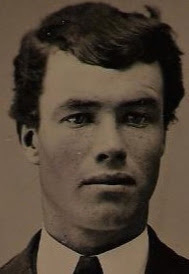 In fact, he's believed to have died in Rock County sometime after 1873 but I haven't found the death record yet. Born about 1802 in Ireland, Tracy immigrated to Canada in the late 1820s, had my 4th great-grandmother Mary Jane Tracy about 1832 in Hamilton Twp (Cobourg), Ontario. When Mary Jane's mother died in 1837, he remarried in 1841 to a Catherine Fitzpatrick. They went on to have 10 kids. Michael immigrated to the United States with his second wife in about 1853, settling in -- you guessed it, Rock County, Wisconsin. He had a brother John Tracy who was already there. My ancestor Michael Tracy and his brother John had children who lived in Janesville, and MANY descendants in Janesville. As far as I can tell, Paul Ryan was not one of them, but he was likely neighbors/friends/etc. with many of my own blood relatives, also of Irish descent, Tracy descendants. Another interesting tidbit: Paul Ryan is HIMSELF a descendant of the Fitzpatrick family. His great-grandfather Patrick W. Ryan was born in 1862 in Wisconsin to Irish immigrants Patrick Ryan and Margaret Fitzpatrick. She was born in 1840, and there's no indication she's related to Catherine Fitzpatrick Tracy. But you never know.